American Skunk Cabbage Lysichiton americanus is planted in groups along the streamside at the Valley Garden Harrogate. Over the years the plants have seeded themselves freely and now make a fantastic display covering the full length of the stream and beyond. The yellow flame-shaped flowers really called spathes, are 18 inches high and look magnificent reflected in the water in April and May. Then the flowers are followed by enormous paddle-shaped, leathery green leaves which remain until dieing back in autumn. Lysichiton camschatcensis has a hypnotic white spathe and lime green flowering head and a cross between the two species produces a cream spathe (I like to call a spathe a spathe). This spathe surrounds a cigar shaped stem called the spadix which bears many small, bisexual green flowers. The name Skunk Cabbage is a reference to the strong scent the flowers emit to attract pollinating insects early in the season. Lysichiton americanus shown above has an RHS AGM. Skunk cabbages grow best in deep soil rich in humus that has plenty of moisture. That makes them ideal plants for bog gardens, marginal plants and stream sides and will make sizeable clumps. Skunk Cabbage are rhizomatous herbaceous perennials and can be carefully divided. Plants are generally disease and predator resistant so are easy to maintain. Ripe seeds sown in good seed compost should be kept saturated by standing in water and the resulting plants will take up to 6 years to flower. 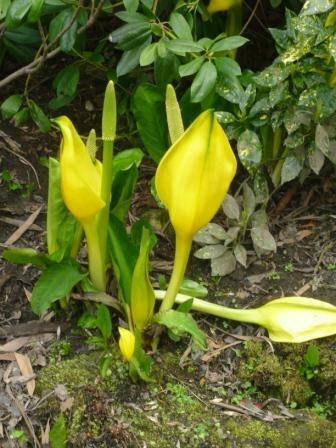 Skunk Cabbage flowers in sun or partial shade but dislikes full shade. The Iroquois native Americans used the boiled leaves as ‘famine food’ but that is not recommended as the plants contain Oxalate crystals which burn the lips and throat. It may be a bit grizzly but Bears coming out of hibernation eat the Skunk Cabbage as a laxative. The leaves have been used to wrap food for cooking or as baskets for foraging. 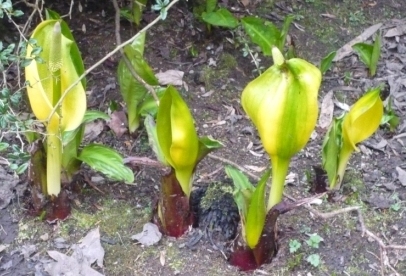 In some medical otany reports the Skunk cabbage was also used as a diuretic or for children with worms. I see a huge patch of these as I drive to work and they do look pretty. Shame the fragrance is not pleasant.